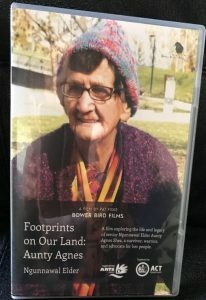 Footprints on Our Land is a stunning documentary film, which explores the life and legacy of our most senior Ngunnawal Elder Aunty Agnes Shea who was born in 1930. The film provides an historic account of her life as a survivor of racism. It depicts her early life growing up on Oak Hill and Hollywood missions in Yass, as well as highlighting her many achievements as a loving mother, caring grandmother, great grandmother and strong advocate for her community. The 38-minute film cleverly weaves many stories of Aunty Agnes’s ancestors and her own life experiences together with use of archival images and film, while interleaving a variety of first-person interview accounts to showcase moments in Aunty Agnes’s life journey to date. The DVD is available for borrowing from the ACT Library Service with copies available at all ACT Libraries, as well as through the ACT Heritage Library.